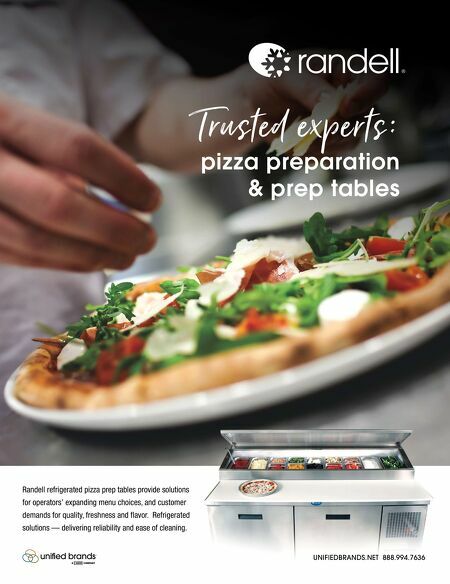 6 • FOODSERVICE EQUIPMENT & SUPPLIES • JANUARY 2018 publisher's perspective If You See Something, Say Something … A s a woman who has worked closely with men in male- dominated industries for more than three decades, you can believe the #MeToo movement holds some resonance for me. I applaud the brave women who have recently found the courage, in numbers, to give voice to their stories and name names. The flood of new allegations does not appear close to being over. Only after this period of discovery can we, as a society, hope to have an adult conversation about acceptable male behavior in the workplace. As we have already seen, the stakes will be high for those men who don't get the mes- sage. The stakes have always been high for the women subjected to their abuse. As a working woman, I have gotten a fairly good look at the underside of the glass ceiling. I know what it means to be paid far less than my male peers for doing the same job. I have had to confront bosses for their inappropriate behavior toward younger women in my charge. At times, I have had to willfully look past inappro- priate behavior and strain to see the good in otherwise decent men. And that brings me to a key truth missing from our national conversation about men and women in the workplace: There are many more good and decent men out there than there are bad guys. As a woman entrepreneur and the leader of a woman-centric company, I owe much of my success to mutually beneficial collaborative work relationships with men. Has that presented challenges? Sometimes. Has it been rewarding? Absolutely. The passing of a friend of mine this past December brought this home. Tom Schrack Sr. of Hockenbergs, now part of TriMark, was the recipient of FE&S' Hall of Fame Award in 2011. Tom was a darn good businessman who earned the respect of his peers in the dealer community over many years of service. He was a man who plainly had his priorities of family, business and community in order. And Tom worked hard to realize his vision for all three. In 2010, one of my dreams came true when I acquired FE&S and formed a company of my own. At that time I asked Tom for his support, and he gave it without reservation. He brought a large contingent to FE&S' 2010 Dealer of the Year and Industry Awards Gala and because of his stature and influence, others followed. For me, a conversation with Tom was like having a conversation with my own father, and that's the highest compliment I can give. 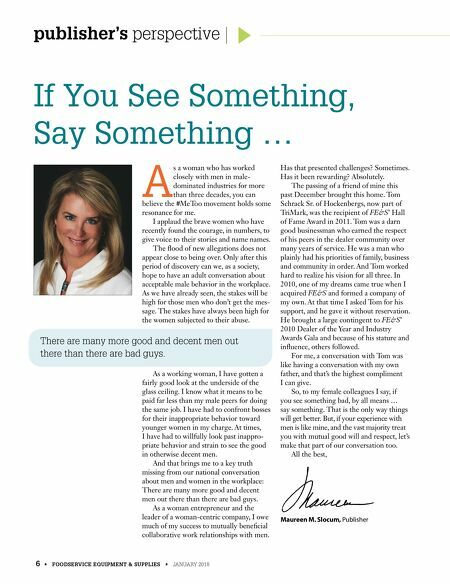 So, to my female colleagues I say, if you see something bad, by all means … say something. That is the only way things will get better. But, if your experience with men is like mine, and the vast majority treat you with mutual good will and respect, let's make that part of our conversation too. All the best, Maureen M. Slocum, Publisher There are many more good and decent men out there than there are bad guys.